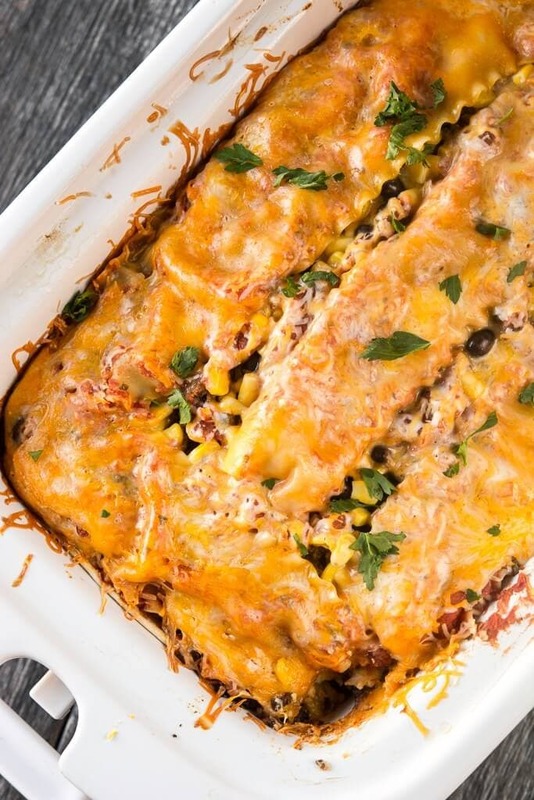 Mexican Lasagna combines two of your favorite food groups into one satisfying and easy meal! The flavor combos are unreal and using your slow cooker is a genius way to make this updated comfort food a new family favorite! Want a meal the whole family will be on board with? How about one that combines two favorites into one meal?! 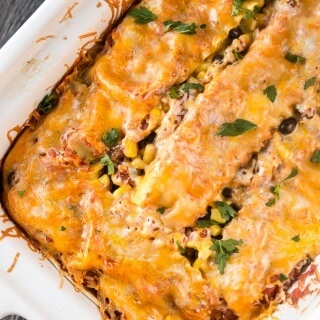 Take lasagna and tacos and mix ‘em up and make a Taco/Mexican Lasagna! 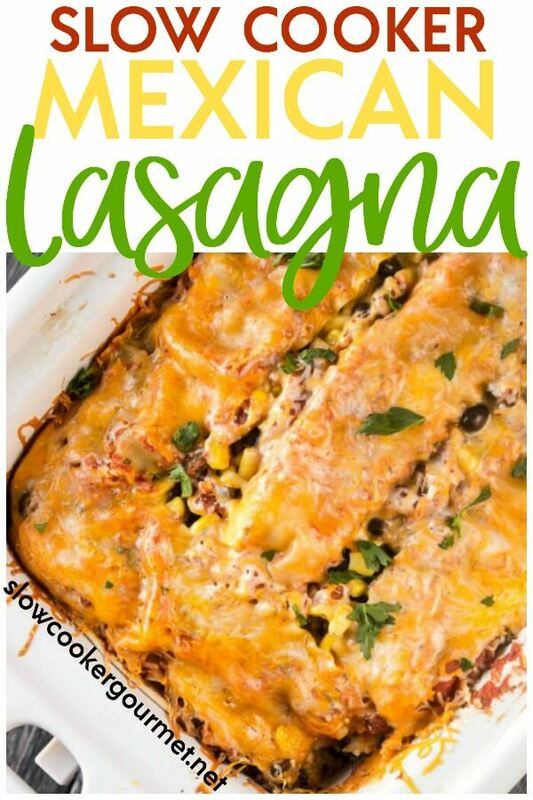 Using the traditional ingredients of lasagna noodles, hamburger and ricotta cheese and combining them with black beans, tortillas, and taco seasoning turns this meal into a great flavor combination! 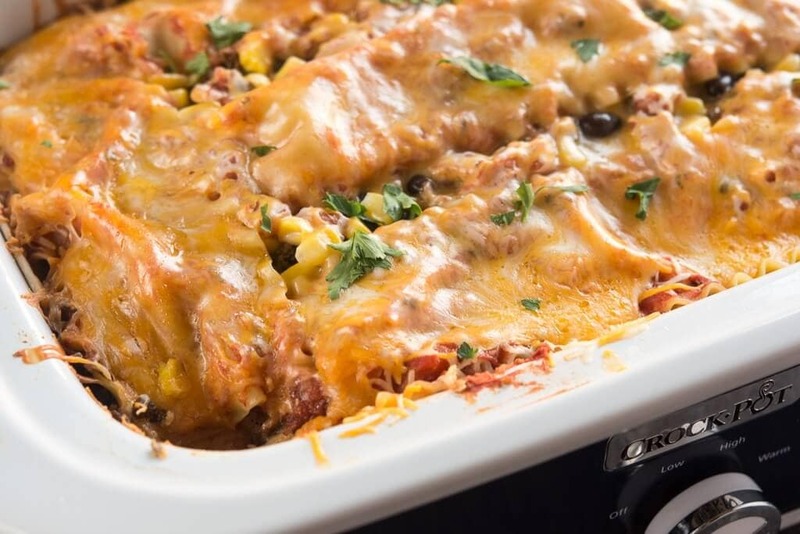 It comes together easy and cooks perfectly in my casserole slow cooker! I used my homemade taco seasoning in this recipe and if you haven’t tried it yet I strongly encourage you to mix up a batch! I love it because it uses the spices I pretty much always keep on hand so if I don’t have any seasoning packets in the pantry I can always make it. Plus, the flavor is great AND you can even customize it! ‘Fresh Style’ salsa you can pick up from the deli at the grocery store is encouraged for this Mexican lasagna. For recipes like this or even in soups, using fresh salsa makes such a big difference in flavor. Another way to keep this slow cooker meal tasting ‘fresh’ is to grate the cheese you use off the block instead of pre-shredded cheese. 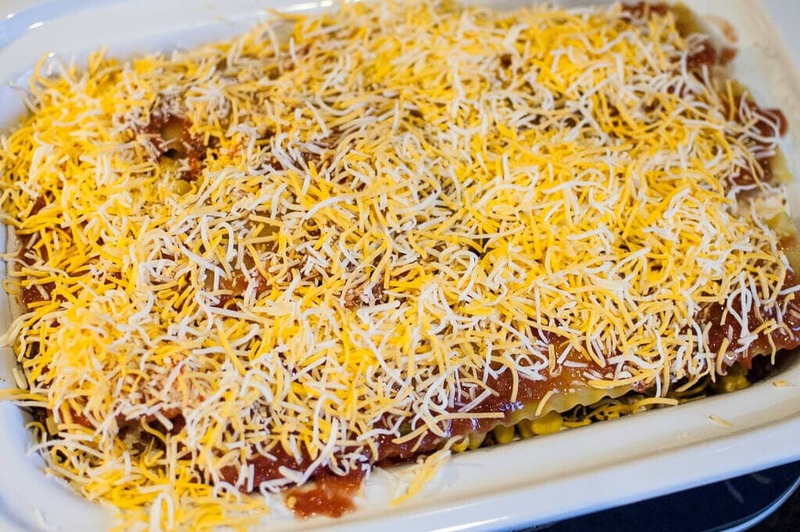 Pre-shredded cheese is super convenient and I use it frequently, however to shred it yourself for this recipe only takes a couple of extra minutes and I think you will really notice the difference! Something I’d sure like to try someday is making homemade pasta noodles. I need to investigate what tools are required because I’m guessing I don’t have them. So, for now I continue to use store bought noodles and they work just fine! 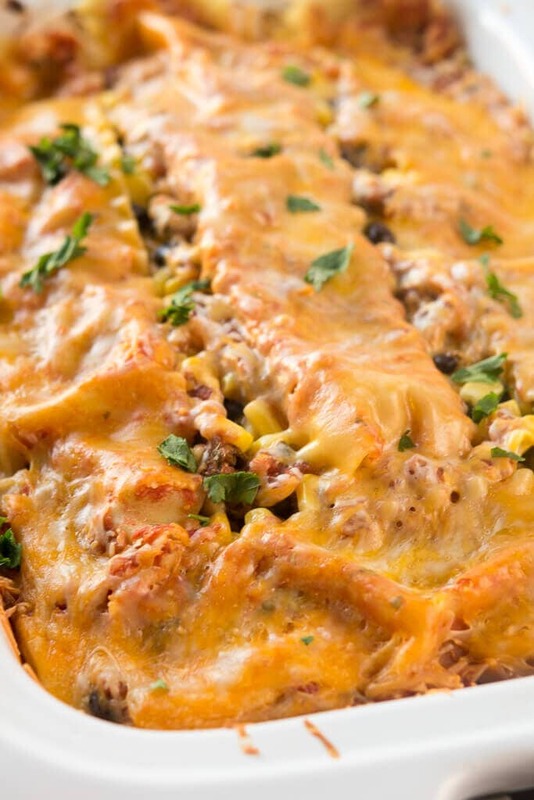 Use the easy oven ready lasagna noodles for this recipe and the only pan you’ll have to dirty is one to brown up the hamburger. 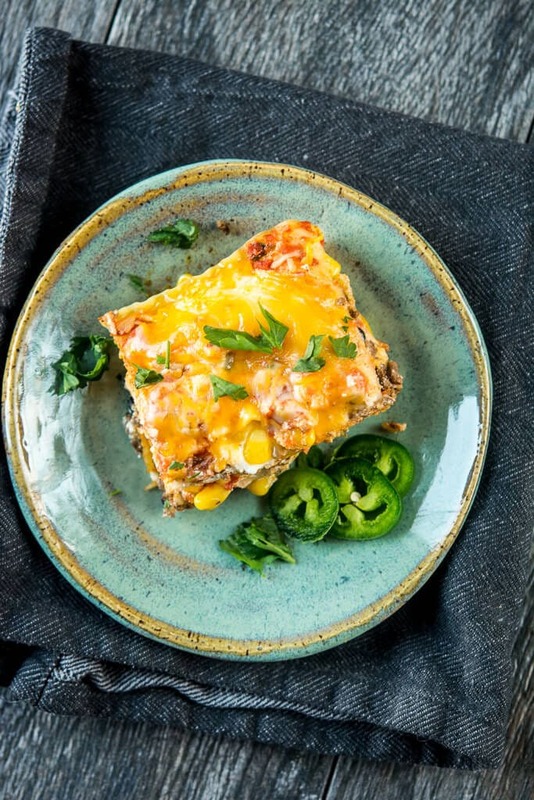 This Mexican Lasagna is the perfect recipe to pack full of veggies, your family will have no idea just how healthy this comfort food is. Try these different variations! Just be careful with anything that has a high water content like zucchini. Salt and drain some water before using it, otherwise your lasagna may end up soupy. Nobody wants a soupy lasagna! I made this in my 4 quart casserole slow cooker. You may need to adjust your layers accordingly if you use a different size/shape slow cooker. Adjust cooking time slightly if you add additional layers. I suggest at least a 4-5 quart slow cooker for this recipe. Baked at 375 degrees for 20-25 min is perfect. I watched mine very close that last 5min. Fantastic recipe. My family loved it !!!!! It is a little confusing. You say use a 9×13 dish and then say later in a crock pot. I will try it in my 7qt crock pot and hope it turns out. Hi Scott! Sorry that was a bit confusing, I will adjust the wording a bit. I used my 9×13 casserole slow cooker but noted you could use any other larger slow cooker but you would just need to adjust the layering to fit and possibly the cook time depending on thickness. How did yours turn out? Hi! Could you explain how to go about baking this? My slow cooker is too small to layer like this but i’d love to bake it as a casserole. Thanks! Hi Allison! I haven’t tested this recipe out in the oven yet but it should be pretty easy to convert. I’d start with the guidelines on the lasagna package that you use, so for the oven ready noodles I think I would try 375 degrees for 20 – 25 minutes. You will need to keep a close eye on it and of course you can cook it a little longer if it’s not done yet.